Building cars is hard. 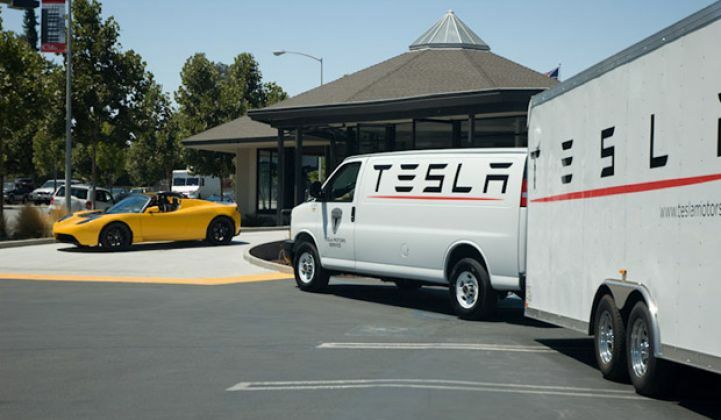 And Tesla (Nsdq:TSLA), the recently public luxury EV company is learning about that with the recent news of a "voluntary safety recall" of about one-third of the total vehicles shipped. One-third sounds like a lot, but it's actually only a few hundred cars. Compare that to the recent BMW recall which is affecting hundreds of thousands of cars. "Tesla Motors has launched a voluntary safety recall on Roadster models 2.0 and 2.5. The recall involves the 12V low voltage auxiliary cable from a redundant back-up system that provides power to various systems, including the headlamps, taillights, turn signals and hazard lights, and airbags in the unlikely event the primary 12V power fails or drops below a minimum threshold value. Located forward of the passenger side front wheel, behind the headlamp, the 12V low-voltage auxiliary cable is physically isolated from the main battery pack in the rear of the car. Tesla decided to initiate a recall after the low-voltage auxiliary cable in a single vehicle chafed against the edge of a carbon fiber panel in the vehicle, causing a short, smoke and possible fire behind the right front headlamp of the vehicle. This issue is limited to the 12V low-voltage auxiliary cable and does not involve the main battery pack or main power system. This recall does not impact earlier Roadster 1.5 vehicles (VIN ending with 500 or before), as these cars do not include the 12V auxiliary cable in question." Obviously, reacting in a fast and forthright manner is the way to go for Tesla in this situation. Tesla's stock price remains unchanged as of this morning.